With a second place in the 450 Pro class main event this past Saturday at the Progressive Auto Centre arena in Sarnia, ON, Rockstar Energy OTSFF Yamaha’s Matt Goerke grabbed his best finish to date in the Rockstar Energy AX Tour. The result also moved him up from fifth into a tie with Tyler Medaglia for third place in the points chase. Goerke’s teammate Dillan Epstein had a less memorable evening, finishing the main in seventh place. Despite his tepid result, he remains in the top-five points standing with fifth place. For Goerke, runner-up seemed to be the script for the evening, as he finished second place in his heat race as well. A strong start in the main ensured Goerke a position with the frontrunners, battling with Cole Thompson, the eventual winner, and Colton Facciotti, who was running in third for most of the race. In the closing laps, Tyler Medaglia ended up completing the podium, however. Goerke, who came into the series recovering from a pre-season injury, has pretty well put that handicap behind him and it showed in his riding. He recorded third fastest qualifying time aboard his Yamaha YZ450F. He looked strong in his heat race and the Clash for Cash, which he finished in third, picking up some valuable extra points. In the main, he rode with confidence and did what he had to do to secure second place. Epstein, meanwhile, couldn’t quite find his rhythm at Round 4 of the six-round AX Tour. He qualified in ninth place and finished fourth in his qualifier. Some confusion by the officials saw a hapless Epstein uncredited for his top-five finish, which meant he had to line up for the LCQ. Undaunted by the experience he ended up winning the do-or-die heat. A mid-pack start in the main – compounded by getting trapped in a first turn pileup – dictated that Epstein was in for an uphill battle on the deeply rutted track, which made passing difficult and risky. When all was said and done he had to take satisfaction with a seventh-place finish and the consolation that he can redeem himself at the double-header this weekend. 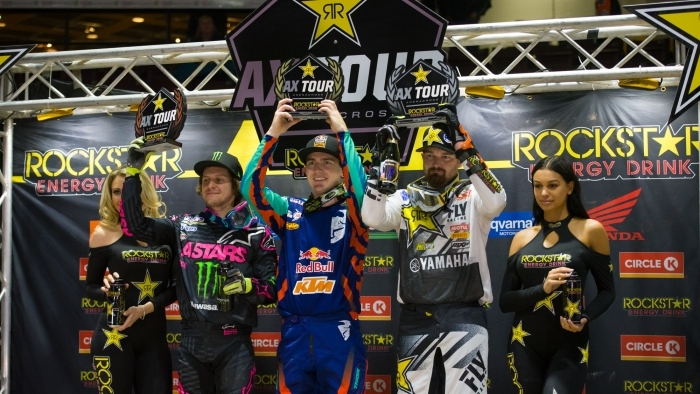 The Rockstar Energy Triple Crown Series wraps up this weekend with Rounds 5 & 6 of the AX Tour at the Molson Center arena in Barrie, ON April 13/14.